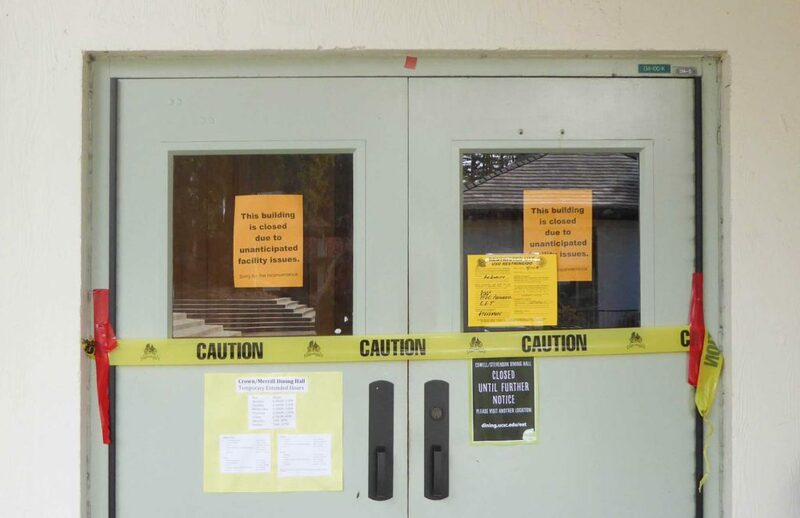 At the end of winter quarter, the UC Santa Cruz Health and Safety team found significant asbestos contamination in five Cowell and Stevenson buildings. 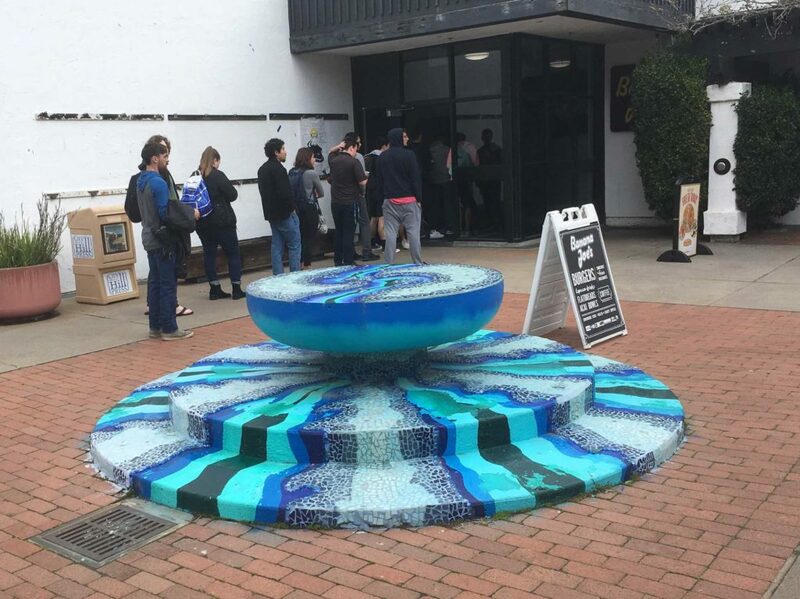 UCSC was forced to close the contaminated buildings and remediate the problem. Stevenson Coffee House barista and third-year student Tonia Brito-Bersi said Thursday night of finals week was supposed to be her last shift before spring break. Two hours before her shift was set to end, a supervisor from Dining Services informed employees of a facilities issue and told them to go home. The student employees were told to leave dishes in the sink and not perform any of their usual closing duties. Brito-Bersi and other employees later learned the reason behind the cafe’s evacuation. During finals week, UCSC discovered asbestos contamination in Cowell and Stevenson Colleges — the product of construction that began in August 2018. Asbestos was used as insulation in almost every building built in the U.S. between 1920 and 1980. 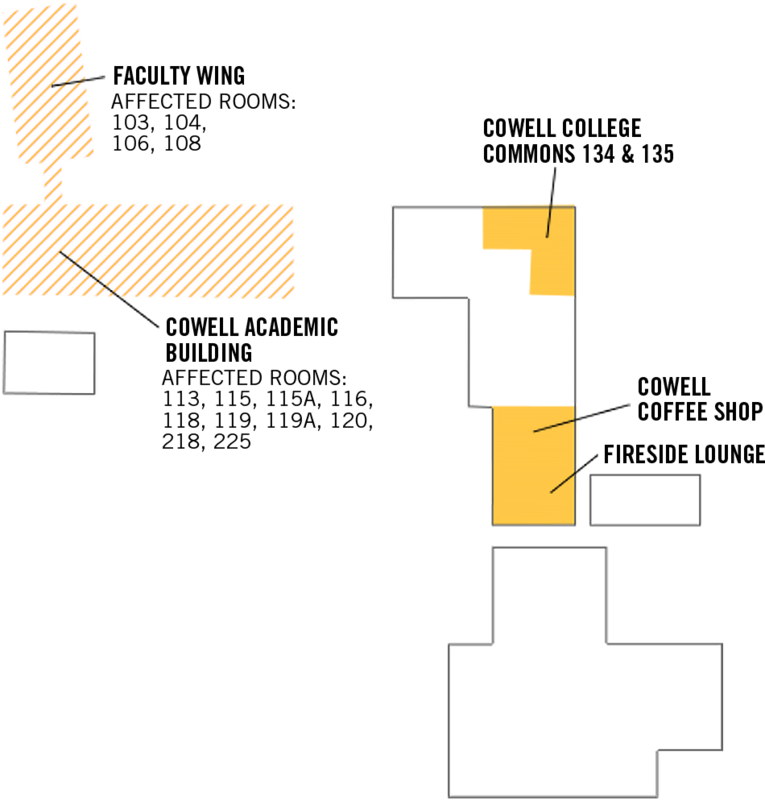 Many of UCSC’s buildings predate the 1980’s, which means every college besides Rachel Carson, Nine and Ten likely contain asbestos building materials. Because asbestos is contained in walls, it typically doesn’t affect people unless workers don’t take proper precautions when working on those buildings. In that case, asbestos seeps into the air and can enter the lungs of those in the room. This can then lead to fatal respiratory diseases like asbestosis and mesothelioma. Contractors installed wall-mounted cable enclosures to protect loose wires from being exposed. To do so, they drilled holes in walls containing asbestos. In March, staff discovered an area not cleaned up after construction. After reporting it to the university, environmental health and safety specialists reviewed the renovated sites. Debris samples confirmed asbestos was present in certain buildings. 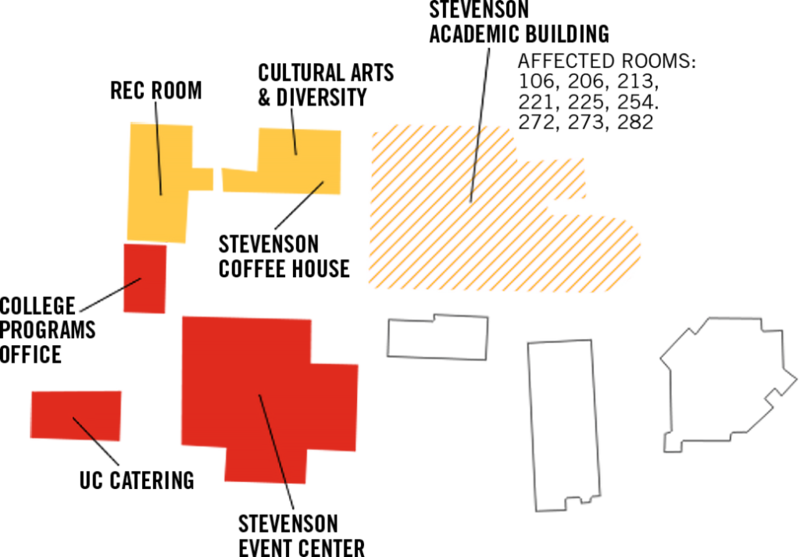 Areas throughout Cowell and Stevenson colleges, including the Stevenson Event Center, range from minor to major contamination, which required them to close. In the midst of this contamination, students and workers’ daily lives are impacted by the construction mishap. Employees from the Cowell-Stevenson Dining Hall, Stevenson Coffee House and Cowell Basic Needs Cafe struggle to keep up their usual hours at alternative locations provided by the university. Wisser said staff have been reassigned to other work locations and all employees continue to work their standard hours. She said their compensation has not been negatively affected. However, student workers’ experiences have not reflected that. Tonia Brito-Bersi said she and her coworkers were offered a small number of shifts at Terry Freitas, but the shifts conflicted with her schedule. Closures forced her and many others to be without a job until the coffee shop reopens. The employees did not learn the contamination was asbestos until the campuswide announcement. Brito-Bersi said an email from her manager with more specifics regarding how to proceed to report any concerns followed. Initially, she was too preoccupied with her concerns surrounding her job to think about her health. As more information was released, she decided to do research on health risks. Despite no current reports of health-related issues, Lisa Wisser said the campus is encouraging anyone with medical concerns to fill out an online form to report them to the university. Brito-Bersi is also concerned about the loss of community space. There is no exact timeline for these spaces to reopen but there is an up-to-date list of closed spaces on the UCSC website. While spatial closures and inconsistency of work are major impacts, the number one concern many have is their health. 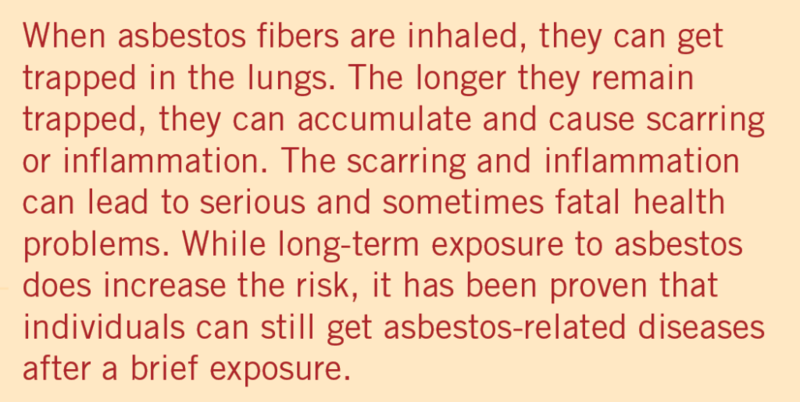 Asbestos exposure can lead to lung issues that often take years to develop. Build up in the lungs often can not be detected for 10 to 50 years. Workers expressed concern over the fact symptoms aren’t often immediate after asbestos exposure.